I found it hard to set up the awning alone, so I devised these awning bases. 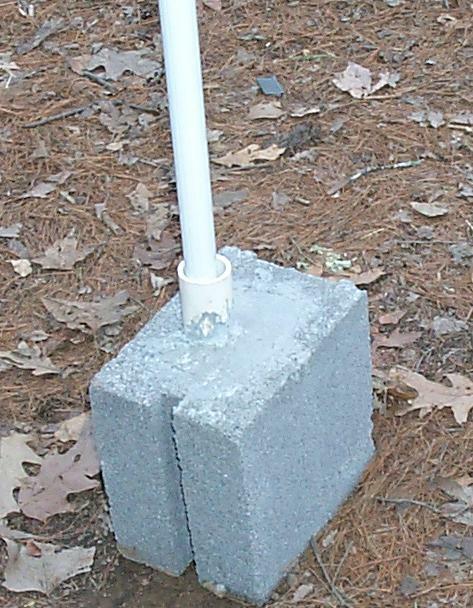 I started with 1 concrete building block and divided it in half (be sure the block has 3 cells). Into the open cell I placed a short piece of PVC pipe that the the awning support pole would fit into, then filling the cell with cement. Now, set up is easy! Crank the top up half way, unzip the awning and unroll. 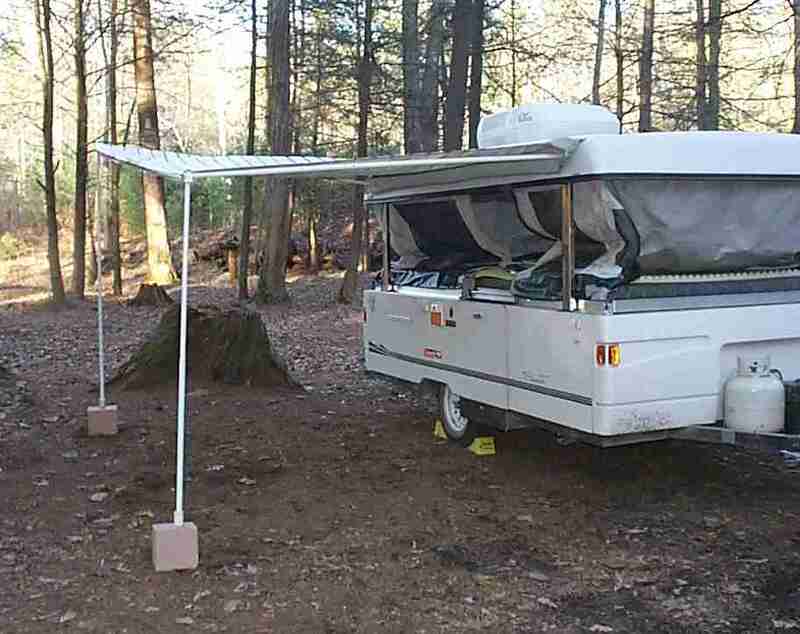 Set each awning leg in the base and then set the 3 bars from the camper top to the outside awning edge. 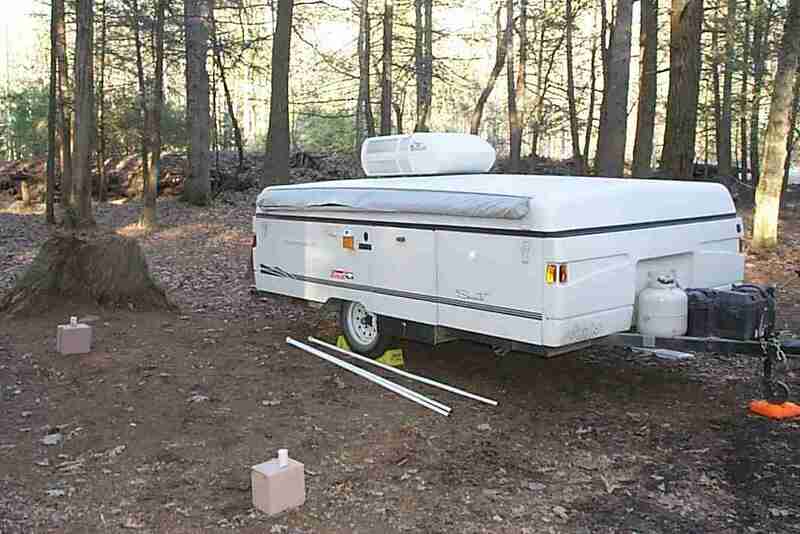 Adjust the bases to have the poles upright, then finish cranking up the camper top. Here are the original bases, without paint. The first step is to unzip the awning bag half way and remove the poles. Set out the awning bases at the approximate location they will be used. Crank the top up half way, or as high as you can comfortably wok on the bag/awning. For ease of use, I place the awning poles on the bunk where I can grab them easily. 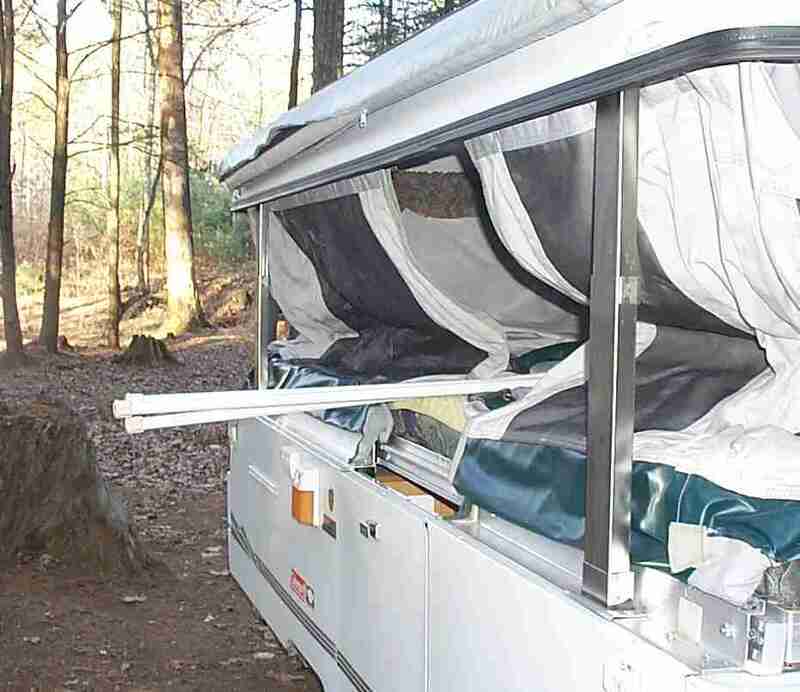 Now you can unzip the awning bag the rest of the way and unroll the awning. 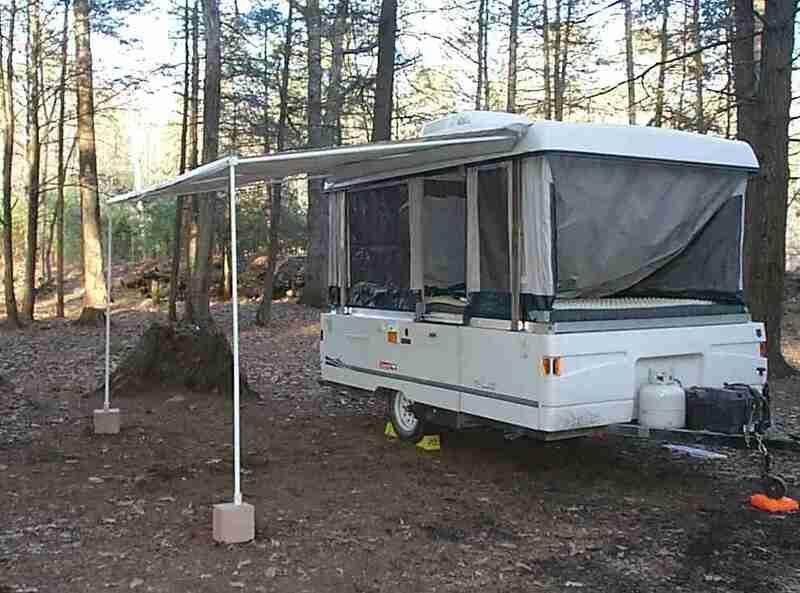 Drop the legs into the bases and grab one of the awning poles from the pop up bunk. Place this pole in the middle position (you will need to keep holding the outer awning frame as the bases can't support it at this point). Once the middle stand off pole is in place the awning will now support itself. Insert the other stand off poles, then crank the pop up roof up. Your awning is now set up. Just remember that if rain is even a possibility lower one side of the awning to allow water to run off. 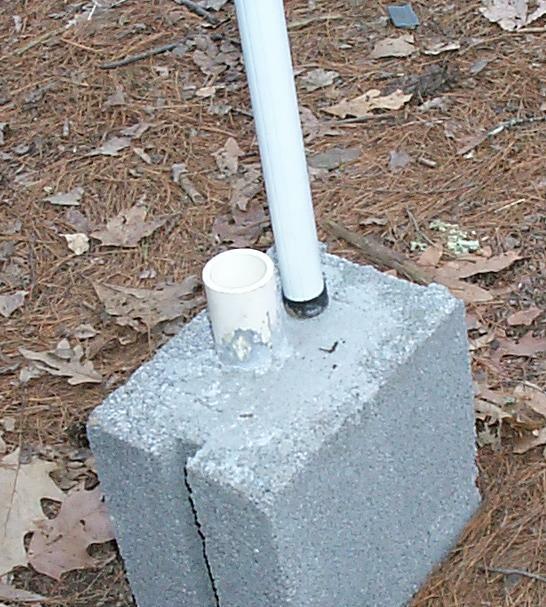 To keep the awning from rising during periods of high wind without the use of ropes, I drilled the base and the pole and insert a pin. Now wind would need to lift the block along with the leg. To cut the block in half, SLOWLY chip along the intended break point with a chisel or block hammer. It takes a few minutes to get it started but it will finally break along the line you are scoring. Don't rush it or try to do it in one shot. For transport they ride just inside our stepper door, on top of the rubber Coleman floor mat. Both the block and cement are available at Home Depot. Go to the building materials isle (around the lumber) and ask for small bags of cement. The small bags are used for patching jobs, but work well for this. After posting this page, several people also built bases and modified the original design. One that I really liked was to use small flower post instead of cement blocks. These look a lot nicer and are easier on the toes if you kick them. 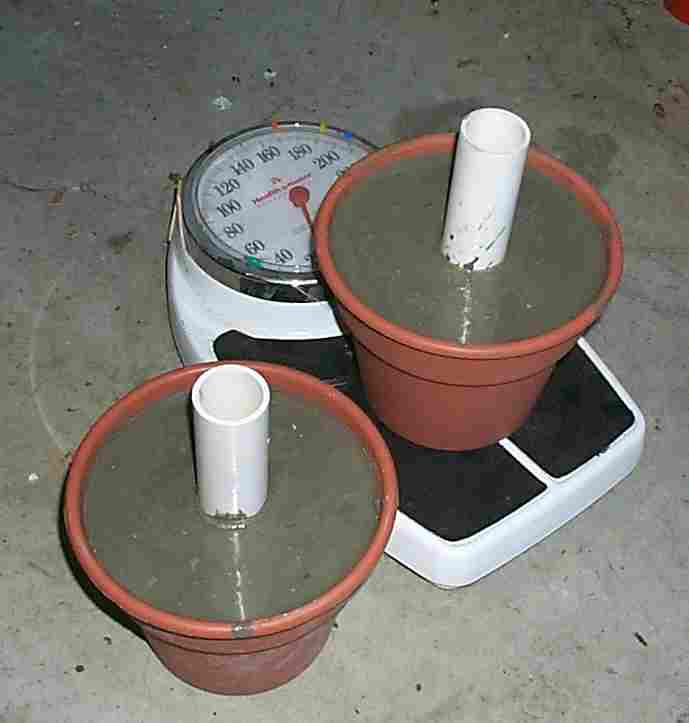 An additional advantage is the flower pots filled with cement are a little lighter, saving me about 8 pounds for the pair. To the lef t you see the finished product as the cement is drying. 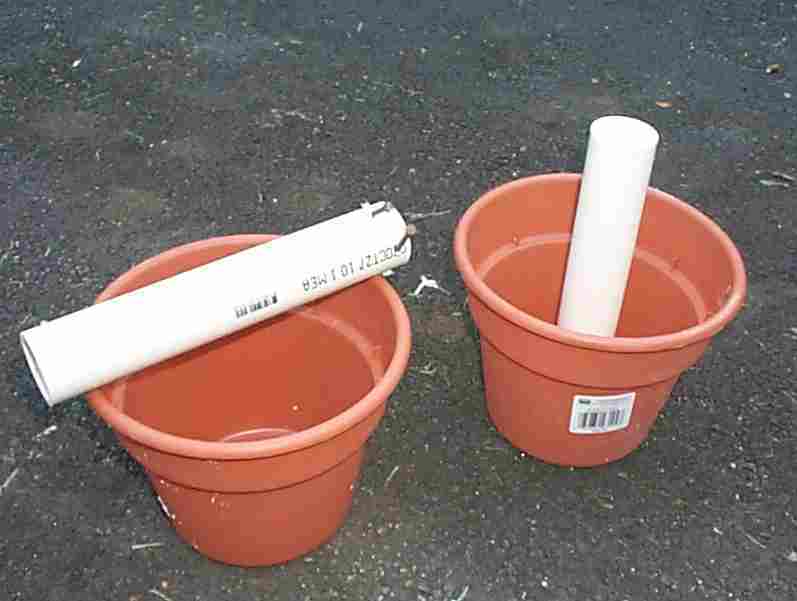 To the right the flower pots and the PVC I used. Note the piece of PVC on top of the left pot. 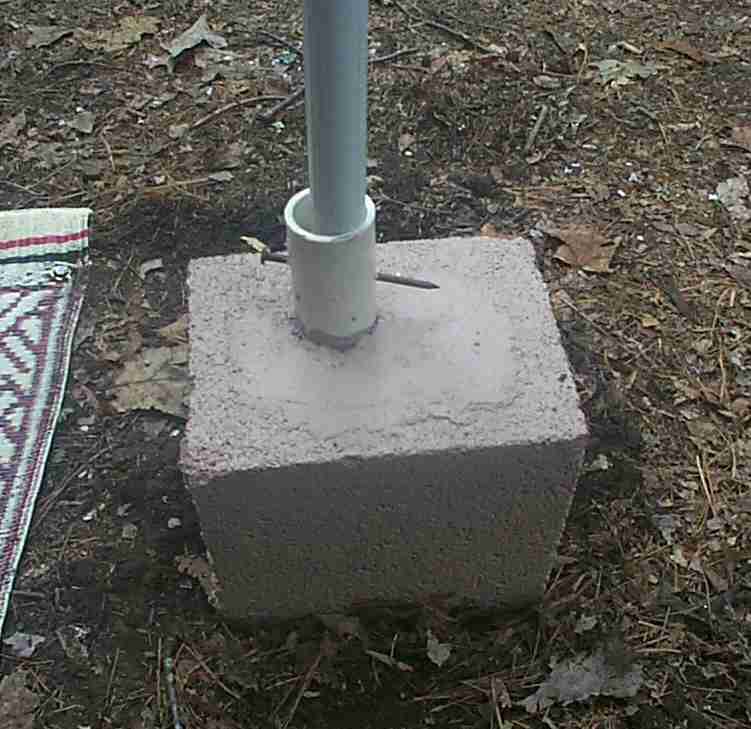 I drilled the bottom of the PVC and placed 2 nails through each one to give the concrete something to grab on to.